Last Updated: 6/14/2018 | File Size: 23414 KB | Price: $39 | Downloads: 146 | Developer: Houdah Software s.
HoudahGeo is a photo geocoding and geotagging tool for Mac. 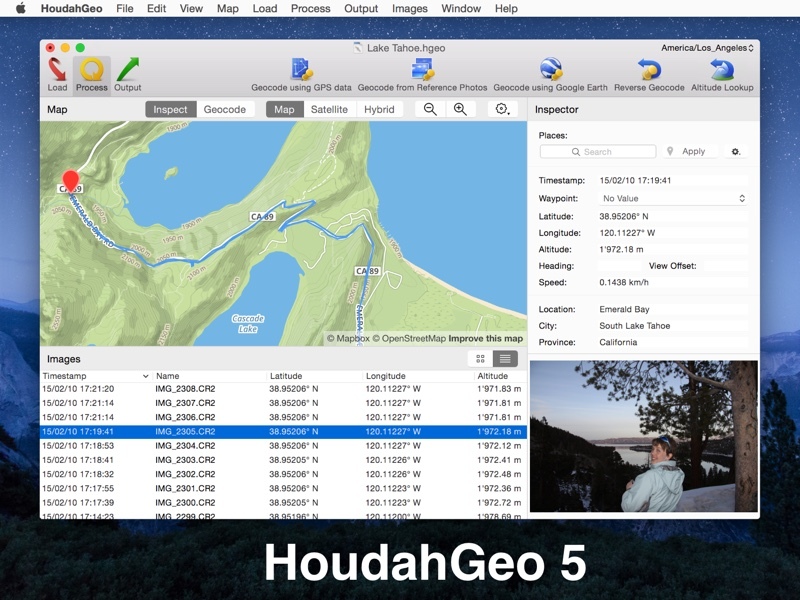 Use HoudahGeo to attach GPS coordinates and location names to your photos. HoudahGeo writes EXIF and XMP geotags to JPEG and RAW image files. This creates a permanent record of where a photo was taken. Just like a GPS-enabled camera. HoudahGeo is the only application that can both write future-proof GPS tags to original images and add also locations to photos in the Apple Photos, iPhoto and Aperture libraries. Geotagging with HoudahGeo follows an easy 3-step workflow: Load, Process, then Output. * Start by loading photos into a HoudahGeo project. Optionally add GPS track logs. * Use the built-in map to assign or adjust photo locations. Use reverse geocoding to add city, state / province and country names. * Write location information to the original image files. Export the project for viewing in Google Earth or Google My Maps. Upload to Flickr. * Works with JPEG as well as a large number of RAW file formats. It also supports XMP sidecar files. Statement: First, please download the orginal installation package by clicking the download link. Of course you may also download it from the publisher's website. Using HoudahGeo crack, key, patch, serial number, registration code, keygen is illegal. The download file hosted at publisher website. We do not provide any download link points to Rapidshare, Hotfile, Depositfiles, Mediafire, Filefactory, etc. or obtained from file sharing programs such as Limewire, Kazaa, Imesh, Ares, BearShare, BitTorrent, WinMX etc. Software piracy is theft. If you like HoudahGeo please buy it.